THE B-MOVIE NEWS VAULT: Umbrella Entertainment's January 2017 releases! UMBRELLA'S JANUARY 3RD RELEASES PROMISE HOLY WEREWOLVES, CRUEL HUNTERS, AND GOVERNMENT CONSPIRACIES! Umbrella Entertainment is starting the new year off right with some truly awesome new Blu-ray titles! 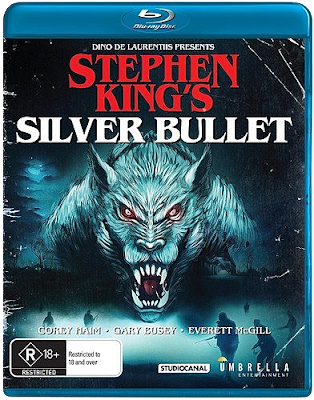 FAIR GAME pits a young woman against a trio of crazed kangaroo hunters, THREE DAYS OF THE CONDOR traps Robert Redford in a deadly CIA conspiracy, and SILVER BULLET has a young wheelchair-bound Corey Haim battling a werewolf to save his quiet town of Tarker's Mill! To learn more about these releases, read on Vault Dwellers! 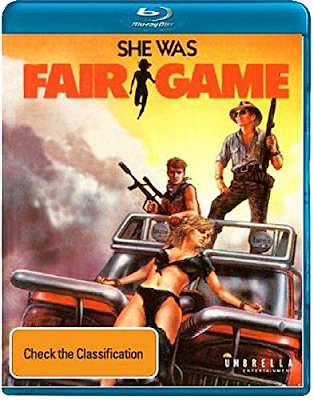 Synopsis: A young woman running a wildlife sanctuary in the Australian outback is in for trouble when she is confronted by three kangaroo hunters. Bored with killing kangaroos, they decide to kill the animals in the sanctuary. And when they see how attractive the owner is, they decide to have a little "fun" with her too. But it turns out that they may get a bit more than they bargained for. Audio commentary with Director Mario Andreacchio & Writer Rob George. Extended Interview with Cassandra Delaney from NOT QUITE HOLLYWOOD. On Location with Fair Game. Behind the Scenes - 1985 TV Report from NWS9, Action News. Behind the Scenes - 1985 TV Report from ADS-7, State Affair. Behind the Scenes with Dean Bennett. Mario Andreacchio Short Films: Vandalism (1981 - 14 minutes), Break-In (1983 - 13 minutes), Taken By Storm (1984 - 25 minutes), Abduction.... Who's Next (1984 - 15 minutes), and Under Pressure (1986 - 15 minutes). Synopsis: When a series of unexplained murders occurs in the normally quiet town of Tarker's Mill, the residents decide to hunt down the killer. Many of these vigilantes end up dead, and those who don't are no closer to finding the assailant. But, when a young wheelchair-using boy named Marty (Corey Haim) encounters a werewolf one night, the pieces begin to come together. Along with his sister and Uncle Red (Gary Busey), Marty begins a mission to end the werewolf's reign of terror once and for all. Audio Commentary with Director Daniel Attias! The Wolf Within – An Interview with Actor Everett McGill! Full Moon Fever – Interviews with Special Effects Artists Michael McCracken, Jr. and Matthew Mungle! Isolated Score Selections and Audio Interview with Composer Jay Chattaway! Synopsis: After his first appearance in 1912 in an American pulp magazine, Edgar Rice Burroughs’ literary character Tarzan became one of the most significant pop culture characters of the 20th century, and the first quintessential superhero. Published in over 20 novels and translated into more than 50 languages, the story of a feral boy raised by great apes was an immediate sensation, spawning radio shows, newspaper comic strips, graphic novels, multiple TV series and countless movies. Though the vine-swinging Tarzan proved hugely popular among audiences, he was often met with much controversy and criticism. Despite the many heated debates surrounding Tarzan, the character nonetheless became a versatile vehicle for highlighting important topics including animal cruelty, colonialism, slavery and the current morals of society. Even Tarzan's primitivist "return to nature" philosophy remains relevant today, further illustrating why this legendary figure has endured generations of cultural change and continues to be such a compelling and timeless hero. From past to present, TARZAN: REVISITED explores the character's extraordinary evolution, giving a detailed overview of how he was first created, behind-the-scenes stories surrounding his innumerable media incarnations, and a fascinating insight into his longevity and legacy in pop culture. 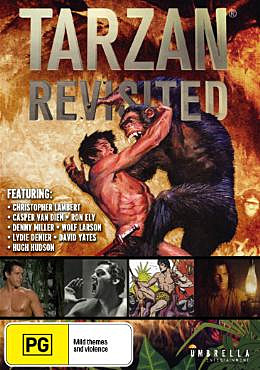 ORDER TARZAN: REVISITED FROM UMBRELLA ENTERTAINMENT. Synopsis: Joseph Turner (Robert Redford - OUT OF AFRICA, THE STING, THE GREAT GATSBY) works for the C.I.A. analyzing espionage novels to find plots that might be useful to investigators. Upon returning from lunch one day, he discovers with terror that his colleagues in the agency have all been ruthlessly murdered. Slowly a conspiracy inside the C.I.A. unfolds, and Turnertales it upon himself to expose the truth. 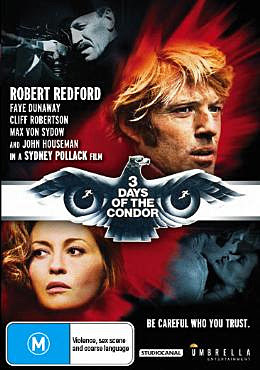 Masterfully directed by Sydney Pollack (OUT OF AFRICA, THE INTERPRETER), THREE DAYS OF THE CONDOR is the story of one mans struggle to discover who are his friends, and who are his enemies. ORDER THREE DAYS OF THE CONDOR FROM UMBRELLA ENTERTAINMENT. Synopsis: Tough, determined and capable, Georgia Perry has long dreamed of joining the elite ranks of those who have sailed solo around the world. Alone on her 38 foot yacht Leander, save for her cat Taco, her one contact with the outside world is a two-way radio. Then, strange occurrences begin on the homeland stretch of her solo voyage when the yacht is becalmed and immersed in dense fog in the Indian Ocean. Georgia's nerves are soon stretched to breaking point after several sleep-deprived days pass. A childhood marred by tragedy has left emotional scars that threaten to resurface under the rigours of such an endeavour. With no breeze to fill her sails, she drifts in fog where her fantasies, demons, fear and phobias start to visit. 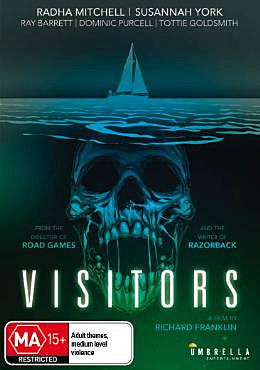 ORDER VISITORS FROM UMBRELLA ENTERTAINMENT.